Do not miss a unique event where music, video games and pure spectacle are mixed in a unique experience Video Games Live! An explosive experience in the entertainment world created and produced by veteran video game composer Tommy Tallarico. 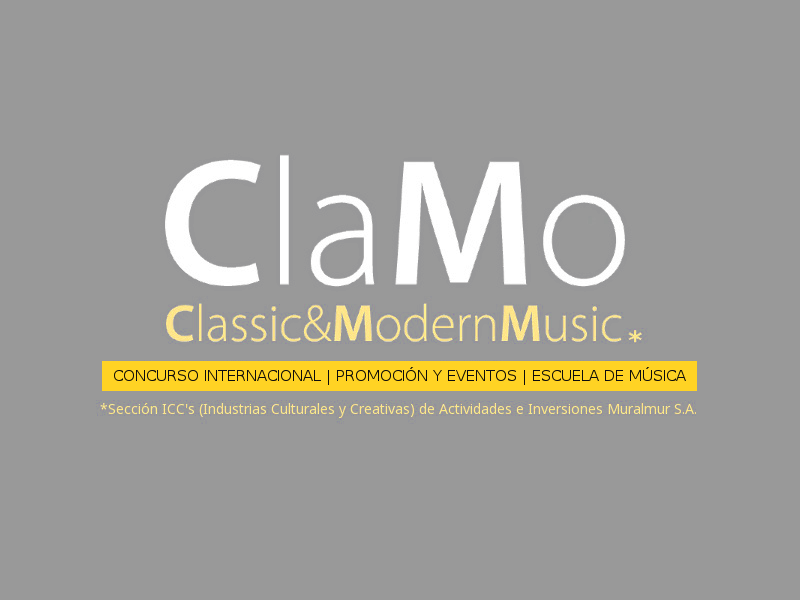 The Clamo Music 2019 International Piano Competition, a cultural event for the international diffusion of the Region of Murcia. The Clamo Music International Piano Competition Murcia Region is consolidated in its fifth edition, as one of the piano competitions with more international projection for candidates. The Clamo Music International Piano Competition Region of Murcia is twinned to China, Russia and Germany. First Clamo Music International Young Piano Competition to be held from July 16 to 19, in collaboration with different institutions in China, Russia and Germany among other countries. Please subscribe to the Video Games Live mailing list at www.videogameslive.com HELP US CREATE THE SETLIST FOR THE SHOW BY WRITING YOU WOULD LIKE TO LISTEN IN THE CONVERSATION PANEL! Click on our special announcement page and feel free to ask or comment below the event. Be sure to tell us what you would like to hear! Please, fast to spread the event among your friends and let them know that you will attend by sharing this event on your wall. THANK YOU! Video Games Live Murcia is an immersive concert featuring music from the best videogames of all time. Created and produced by veteran videogame industry composer Tommy Tallarico, the greatest orchestras and choirs around the world perform accompanied by exclusive videos, synchronized musical arrangements, lights and lighting, special effects, soloists, electronic percussion, live action and unique interactive segments to create an explosive experience in the entertainment world. The best way to describe Video Games Live? Imagine the energy and excitement of a rock concert mixed with the power and emotion of a symphony orchestra and chorus combined with technology, interactivity, incredible visualizations and the fun that only video games bring. Impressive videos completely synchronized, the latest in lighting and special interactive segments dazzling the audience of all ages, both for fans of video games and for all those who value orchestral music. Do not miss a unique event where the best music, video games and the pure spectacle are mixed in a unique experience Video Games Live! in Murcia. TWO CONCERTS, ON NOVEMBER 22 and 23, 2019. The Clamo Music International Piano Competition celebrates its 5th edition and consolidates its position as the most international musical event for piano. Murcia, in collaboration with different institutions in China, Russia and Germany, celebrates the I Clamo Music International Youth Piano Competition. REGISTER NOW! VIEW THE CONTEST WEB SITE, REGISTER AND DEMONSTRATE YOUR TALENT. YOU EXPECT GREAT PRIZES AND AN OPPORTUNITY WITH LIMITED PLACES. La V edición del Concurso Internacional de Piano Clamo Music Region de Murcia 2019 se celebrará el 10 y 11 de mayo en el Conservatorio Superior de Música de Murcia, cuya entrada es gratuita, con la presencia de excelentes pianistas internacionales. El domingo 12 de mayo, como culminación de este evento, se realizará en la sala Miguel Angel Clares del “Auditorio Víctor Villegas” de Murcia el acto de entrega de premios, actuación y recital de piano de los 10 finalistas. The academy Clamo Music, in collaboration with the Autonomous Community of the Region of Murcia (Ministry of Education and Culture), the Hon. City Council of Murcia (Department of Culture), The Conservatory of Music of Murcia and thanks to the support of various sponsors and sponsors, organizes on 10, 11 and 12 May 2019 the Fifth Clamo Music International Piano Competition in the city of Murcia. The registration period for all candidates for the contest will be open until January 31, 2019. Sign up for the next Clamo Music International Piano Competition, important cash prizes, concerts, an international artistic environment and a strong promotion in specialized media. they wait for the best valued contest for the great attention dedicated to each one of the participants. Subscribe to the Clamo Music channel on YouTube and find the performances of the participants of all the editions of the contest. "The Clamo Music Contest is one of the best organized competitions I have experienced. The atmosphere was very edifying and the possibilities of action, enormous. Chema Casanova was able to create a beautiful experience where we could exchange knowledge and love for music." "I felt that the organizer prepared and planned the competition thoroughly and I appreciate all that consideration. Everything was perfect and fantastic. It was a very good experience for me, with a free and happy atmosphere. Above all, I have been very happy at that time." "My deep thanks to Chema Casanova for the perfect and warm organization and the great support of the Government of Murcia. It is an incredible opportunity for the musician. This type of initiative will make the culture bigger around the world. It must continue!" Clamo Music collaborates with Pianos Klavier and the City of Murcia in the event Pianos en la Calle, which takes place in Murcia annually. Clamo Music has as a priority the promotion of talents and artists of musical environment. The Clamo Music International Piano Competition has allowed us to create a highly specialized work environment and group, ideal for the launching of national and international pianists, creating a circuit in which the pianist can feel the attention, closeness and security that a High level professional requires to embark on a successful professional career. Therefore, in addition to being an international gateway and gateway for prestigious enclaves and concert halls, at Clamo Music we are concerned so that the artist has the right environment in each activity, with personalized advice, planning and project management, creating appropriate networking and managing all the facets necessary for the promotion of each artist. At Clamo Music our point of view is that of the artist, it can not be otherwise since our entire team is made up of professional musicians, that is why we put our utmost effort in getting the artist to reach their expectations, with full understanding and high ability of resolution of all the details that usually occur in the career of a professional artist.